Thanks to speedy action from Sandy Adam and William Sommer at Sigma-Aldrich we have our first official sponsor for the Open Notebook Science Challenge! They are willing to donate compounds (aldehydes, carboxylic acids and amines) to schools in most parts of the world for them to do solubility measurements under ONS conditions. Contact me if interested in more details. Thanks to Andrew Lang for the slide with the 3D plot showing the reaction yield space. This is my first time using Camtasia 5 - it lets you zoom into areas of the screen that are under discussion. I think that is pretty handy for screencasts involving web pages, where there can be a lot of small text. The wiki for the Open Notebook Science Challenge that I proposed during my UK trip is now available. We are currently looking for sponsors and participants. The first round of this challenge calls upon groups or individuals with access to materials and equipment to measure the solubility of compounds in organic solvents and report their findings using Open Notebook Science . Understanding exactly how an experiment was performed is essential to the efficient progress of science. There are no absolute facts in the scientific literature; every measurement reported is only meaningful within the full context of how it was generated. The purpose of a laboratory notebook is to report as much of this context as is reasonable. But to find trends data must be abstracted to a level where they can be manipulated in tables and charts. This is not a problem as long as one can drill down from each data point in a chart to the full context found in the laboratory notebook. For example, a Google search for "vanillin solubility in THF" pulls up a lab book page EXP207 where it is reported to be 3.89M. This number might be used in a table of someone trying to quantify trends or test a mathematical model, in which case reliability of the number is important. By reading the lab notebook page it becomes clear that 118.5 mg of solid was measured on a scale with 0.1 mg accuracy. However only one measurement was obtained. All kinds of other details which might be important are provided, for example how long the mixture was vortexed, at what temperature and the physical appearance after evaporation. If this number turns out to be an outlier, one can investigate if a calculation error was the cause by inspecting the linked spreadsheet. However, if a researcher is simply looking for the feasibility of making up a 2M solution of vanillin in THF for a reaction the margin of acceptable error is so wide that the answer is almost certainly "yes". The purpose of Open Notebook Science is to allow immediate communication of scientific results. The value of these results will depend upon the quality of the laboratory notebook and the linked raw data. Publication in peer-reviewed journals is still an extremely important part of this process but it is not an appropriate vehicle for the efficient communication of this type of information. In fact, one of the motivations for participating in this project is that we will collect data from sufficiently well recorded experiments and publish them in a peer-reviewed journal with the participation of the researchers as co-authors. We aim to build a mathematical model to predict solubility using the results obtained from this project. Simply request an account on this wiki and start recording experiments using a format similar to UC-EXP207 . The organizers will provide feedback in the form of comments in bold and italics directly on the wiki. Hitting the Recent Changes link on the left navigation bar is a good way to keep track of edits. Graham Steel just posted Cameron Neylon's recording of the session Communicating Primary Research Publicly by myself, Heather Etchvers and Bob O'Hara. Lots more from the Nature Scientific Blogging Conference in London in August 2008 is available on Nature Networks. Two researchers explain why they're posting their experimental results online. Risking being scooped and having patents refused, some scientists are posting their data online as they produce them. 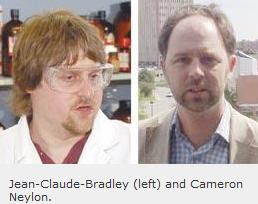 Organic chemist Jean-Claude Bradley of Drexel University in Philadelphia, Pennsylvania, and biochemist Cameron Neylon of the University of Southampton, UK, describe this 'open notebook' approach. We were actually a little more cheerful than we appear in the photos. The Ugi reaction involves the mixing of four components: an aldehyde, an amine, a carboxylic acid, and an isonitrile. The Ugi reaction is a convenient reaction to generate diverse libraries and has been used in the past to generate antimalarial compounds. The particular Ugi reaction that we consider involves the reaction of furfurylamine, benzaldehyde, boc-glycine and t-butylisonitrile. This reaction produces a Ugi product as a precipitate when run at 0.5M concentration in methanol. We will describe the optimization of this reaction by varying the solvent, concentration, and excess of some reagents. This webinar will last for 30 minutes and at the end there will be an interactive Q&A session providing you with the opportunity to ask questions relevant to your particular application. Register for the webinar on Tuesday, September 23. I’m about half way through the UK trip that Cameron Neylon organized for me. So far it has proven to be a productive though exhausting Open Science fest. First I stopped by UKOLN at the University of Bath on August 29. Then the Nature Science Blogging conference in London followed by an Open Science Workshop at Southampton University then back to London for a talk at the Nature offices. Cameron was with me at all these events and we even co-presented at Nature. It was a special pleasure to be able to report on the results we obtained in his lab just the previous day. Now a Google search for “boc-glycine solubility THF” pulls up the UsefulChem lab notebook page EXP207 as the first hit. What better example of Open Notebook Science in action? The FriendFeed effect was in full force at a few of these events. People are finding it natural to microblog sessions by posting comments. Richard Grant, Cameron and I made good use of it at the Southampton conference. When a speaker started to present someone would start a thread and others would comment on that thread. It is interesting to see how FriendFeed is evolving within scientific communities. Some perceive that it is mainly to be used for ephemeral conversations. But why not bookmark conversations to document conferences for the longer term? A big problem is FF doesn’t generally make its way into the Google index but bookmarking should force that to happen for selected content. The Southampton conference was also a great opportunity to discuss in detail the challenges and opportunities facing Open Science. If the ideas discussed there get fleshed out in document we may end up referring to a “Southampton Resolution on Open Science”. By the end I think we came to an agreement that a viable compromise might consist of sharing all raw data files associated with a paper after publication. This is a far cry from the ideal of Open Notebook Science, aiming for “no insider information”, that Cameron and I advocate. But it is a step in the right direction and it is not unreasonable to try to get a number of scientists on board. I really enjoyed my conversation with David De Roure from MyExperiment at Southampton U. There is great potential for bringing cheminformatics workflows up to speed with bioinformatics. I agree with David that using ChemSpider web services on Taverna might bring us a long way in that direction. In organic chemistry automatically calculating masses and volumes of reagents based on moles and chemical identifiers like SMILES or InChIKeys certainly would come in handy for minimizing errors and planning time. After the London Science Blogging conference, Cameron, Egon and I headed out to Peter Murray-Rust’s house for lunch and coding. We created a CMLreact file for one of the Ugi experiments that was part of our paper about to appear in JoVE (see here for Precedings version). This can be approached from many different levels of abstraction. We chose to focus on the equimolar 0.4M experiment run in triplicate and ignore the specific sequence or manner of reagent addition. As long as the abstractions point back to the original lab notebook pages with full details, simplifying the representations of reactions is not a problem. But there is certainly not a standard way of this as of yet using CML.